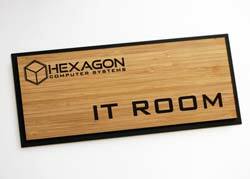 Laser engraved bamboo signs can be customized with your company logo, personalized text or custom design at no extra charge. These natural wood office signs offer a warm look for your office building, restaurant, bar and grill, workout facility, shopping center, or home decor. Create professional looking directional signs, conference room signs, meeting room signs, department signs, reception signs and more! 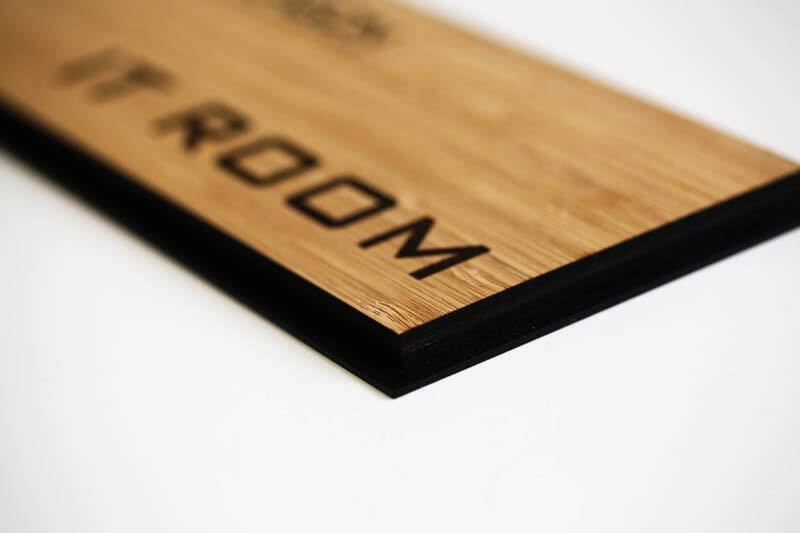 Signs are made of bamboo, a renewable resource, and include a 1/16" matte black acrylic backer that is cut slightly larger than the bamboo to create a border without the bulkiness of a frame. Personalize your Sign - Indicate line breaks using slashes (/). Custom bamboo plaque award with iron stand. 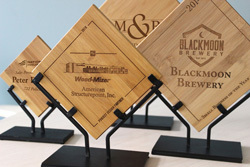 Recognize your employees and corporate team members with quality, renewable bamboo awards. Engraved with your custom message and/or logos. No setup charges. 4 sizes available - Quantity discounts. Laser engraved bamboo coaster set - set of 6 custom coasters with holder. 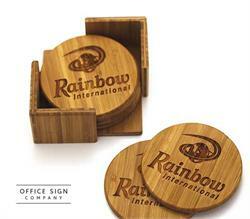 Personalized, laser etched coasters with your name, logo or corporate brand. 3-3/4" coasters by 1/4" thick. Renewable, green product. 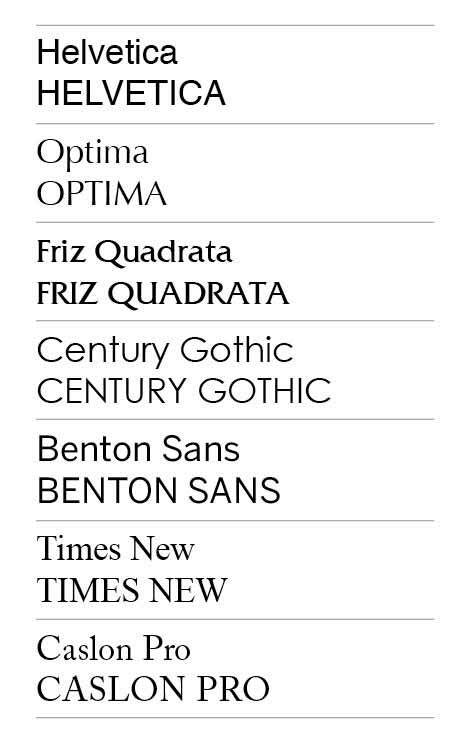 Round or square design. American made. 7"W x 13-1/2"H Bamboo Paddle-shaped Cutting Board Personalize these with any custom graphics or text you would like at no additional charge. A renewable resource. 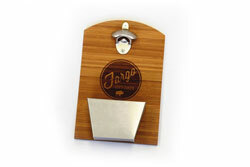 Custom Bamboo Bottle Opener with Tray features a metal bottle opener and catching tray. 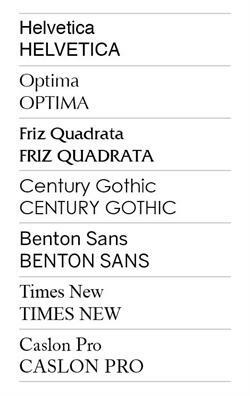 Add your own logo or custom text. Bamboo is a certified renewable resource. 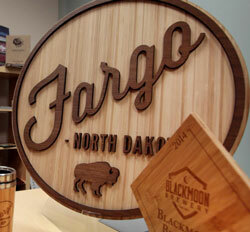 Perfect gift for home bars or garages or trophy piece for your business.